We spent the July 4th Independence Day weekend anchored at the head of the Hood Canal (route map). We went mainly because we’d not anchored there before, and were planning to stay only for the 3rd. This, however, turned out to be a great place to watch fireworks. Private displays are illegal in most cities in the region, such as Seattle and Bellevue. But we’ve discovered that they are legal in unincorporated regions, and everyone seems to set them off. Last year we anchored off Penrose Point Marine Park, in unincorporated Pierce County, and enjoyed great local displays and distant public ones such as Tacoma’s. At the head of the Hood Canal, in unincorporated Mason County, the “pre-displays” on the 3rd were so good that we stayed for the next night. And wow, were we impressed—this was easily the best private display we’ve seen. The head appears almost land-locked at night, and houses ring the shore. 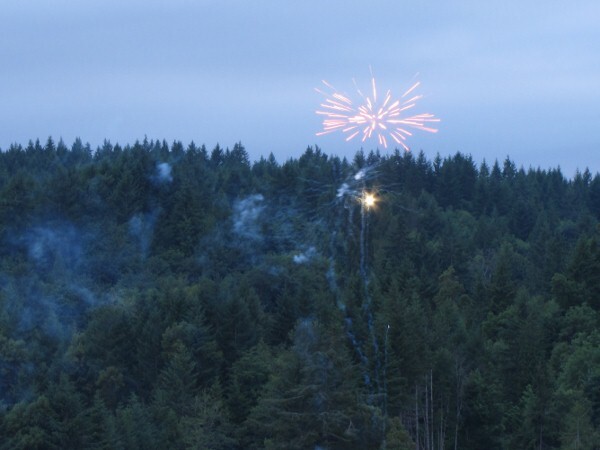 It seemed that everyone was setting off some fairly high-end fireworks—the effect was a near 360-degree constant display. We’ll definitely be back. 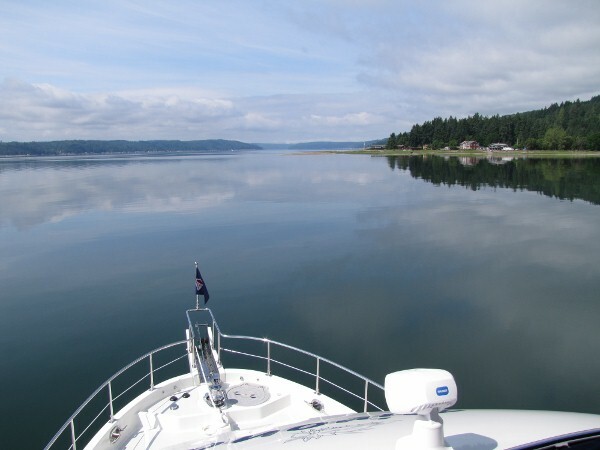 We’ve anchored in the Hood Canal a number of times, but mainly nearer to the mouth and always before the Great Bend. We’d travelled to the head at speed once on a day trip in the previous boat a almost a decade ago, but had never anchored there. The head is a just a long way—about 90 miles from Seattle. You have to travel 30 miles north to Port Ludlow and then 60 miles south all the way to the head. At this point, less than two miles of land separates the head of the Hood Canal from the head of Case Inlet in the south Puget Sound, but Case Inlet is only about 55 miles by boat from Seattle. Surprisingly, we’re finding our short-term cruising range has increased with the 52 rather than decreased, even though it runs a good 5 knots slower. The difference between 14 knots and 8 knots is really not that huge anyway, in terms of distance possible in a day. The big factor is that the 52 is so much more comfortable to run for longer periods of time that we travel farther, and still arrive more relaxed and refreshed than before. Reaching the head of the Hood Canal felt like an easy run.